I'm Mykel from Maryland, USA. This is my first year in ant keeping. I've always dreamed of having my own ant farm since I was a kid but never really knew where to start. Came across AntsCanada back in July and started hunting for queens. I'm very fascinated with ants and have already caught several different species and lots of queens, most of which I'll be putting up for sale on the GAN once they produce their first workers (ninantics... not sure I have the word right). I'm keeping two for myself and my daughter is going to start a farm of her own as well. This is what I've caught so far. I'm approaching this also from a semi-scientific approach as well. I've been keeping a running log of everything I do. I'm planning on keeping one of my Bicarinata as this was the original species that made me want my own ant farm as a kid, watching them out in my yard with their massive heads. I'm also planning on keeping my Ponera as well. Through the amount of care I've had to put in for her in the past month, I've become quite attached to her and she recently laid eggs (I counted 3 but it could have been more). For any of you looking to keep her, through both research and my own experience I find she does well in a test tube setup with some sand substrate (about 1/3 to 1/2 the tube). I provide her 1 fruit fly every single day, frozen, not alive (she wouldn't attack the live ones I put it but tears the frozen ones apart). If you don't have fruit flies, boiled egg yolk does work but you have to remove it a few hours after putting it in to keep it from rotting. I did not provide her an outworld (mostly to prevent humidity from leaking) but instead put the fly directly into her test tube. I kept her test tube in a container (a little drawer container from walmart) with a heat cable and exoterra thermometer to make sure I could regulate the ambient temperature to about 78-82. This species likes warm humid environments so every day when I would feed her I would also use a pippet to add about 5-7 drops of water to her soil farthest from the moist cotton ball. This allowed it to seep through and add an equal gradient of humidity to the sand. She will burrow into the sand and create small tunnels but at this stage in the process, when so many people fail to properly raise a Ponera I cared more about her having a good environment than I did being able to see her. Since she is semi-claustral, she actually explores her test tube quite a lot anyway. I'll probably create a running blog about her at some point if she makes it and successfully raises workers. As of today, I connected her to a small 3 chamber formicarium that a friend 3D printed me and to an outworld as well. I will give it a few days to see if she explores them and if not a may move her back into just her test tube. I did this though to try to minimize the amount of interaction I have with her test tube as right now I'm having to open it every single day. I will provide updates on this new setup in time. Until then, it's great to be a part of the community. Look forward to interacting with you guys! Welcome! If i may ask, how are you IDing your queens? So, first I purchased a 20 and 30 time magnifier and I did a lot of extensive research on the species. Getting familiar with how each species tends to look from watching lots of ant videos gave me a headstart. All I had to do was narrow it down to species in my area and then narrow it down further by the species specific appearances. Number of petioles, color, antenna segments, etc. thanks for the info, I just caught a Ponera queen today! Awesome! Let me know how it goes. I'll be uploading some photos soon of her current setup and a makeshift outworld I had setup (that didn't work, see below). To this point, I have found, despite disturbing her daily in this method, the test tube environment and hydrating her sand (I use playground sand from lowes or home depot that I boiled to ensure it was clean of anything hazardous to her) in her test tube with water has been the best method. She is a very active ant and loves to explore her test tube. Providing her frozen fruit flies or boild egg yolk (remove after a few hours to prevent rotting) has been the most effective way I've found to feed her. I want to try spring tails as well but haven't had the chance yet. Eventually I'm going to order a culture farm of them once I have enough ants. I attempted to connect my Ponera P. queen's test tube to a homade outworld and 3D printed, 3 chamber formicarium created by Safeway ants. The intent was to see if she would discover the formicarium through the outworld and switch locations. 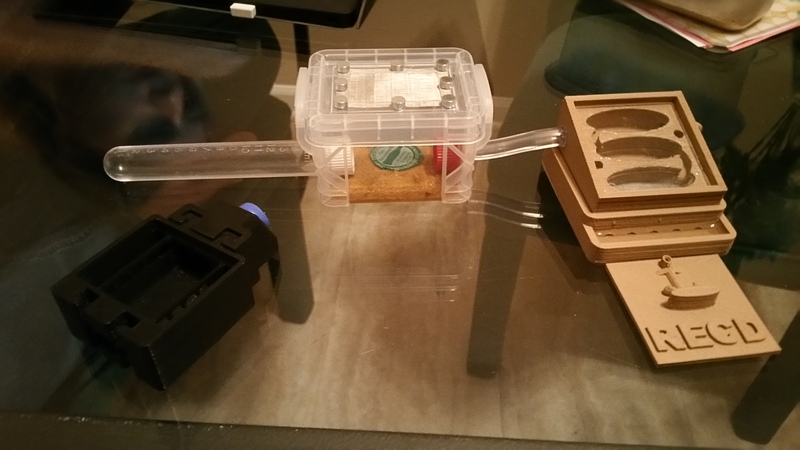 The setup was the test tube connected directly into one side of the outworld (About a 2 by 1 inch box) and on the opposite side a tube connected into the 3D printed formicarium. However, the steel mesh screen I used for the lid very clearly allowed far too much moisture to escape and not only did the outworld dry out entirely within two days, the sand in the test tube began to dry out. As a result of this, my Ponera began piling the dry sand on top of the still moist sand, which I believe she did to further insulate her sand and prevent humidity loss. I noticed a significant decrease in activity. This is very important. Pay close attention to your Ponera because even after laying eggs, the queens are a very active ant. Mine frequently comes out of her tunnels and explores her test tube. Her decreased activity and hiding beneath the sand was a clear indicator that she was not enjoying the dryer air that was getting into the test tube following exposure to the outworld. Another important note in regards to behavior is that this is a subterranean species. They live almost their entire lives without seeing much, if any, of the sun and its light. When I interact with her I do so with the most minimal amount of light I can. They like it warm, humid and dark. I usually used red tinted lights or keep her in a shadowed area when I'm interacting with her tube for feeding or hydration. Maintaining a moist environment with an open outworld is VERY difficult to do. I think most ant keepers will agree here. At least, most I've met have. 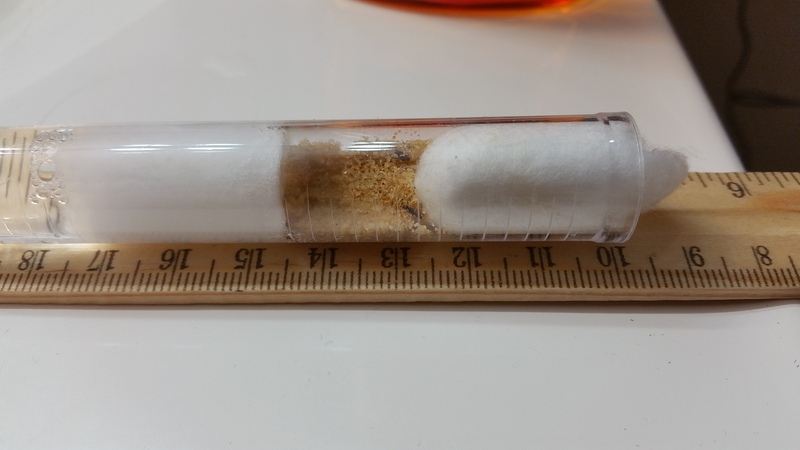 An early experiment I had done with my Ponera (prior to her laying eggs) was adding her test tube into a tupperware bowl of sand with 3 holes cut in the top and stuffed with cotton balls. This is a method I've seen done similarly with Trap Jaw ants on both Nordic ants and AntsCanada. I found this to retain humidity very efficiently but ultimately decided against keeping her in the environment due to her tendancy to burrow in the sand of the outworld and terrifying me that I might accidentally drown her when I hydrated it. With Trap Jaw ants, they are much bigger and so this is less of an issue but with how small the Ponera is, keeping tabs on her in this environment proved exceedingly difficult and potentially hazardous. I have considered attempting the experiment again but am undecided on this at the moment. Thoughts on this? I came across a tutorial where they separate the chambers using Styrofoam and Nordic ants did a similar thing for his Trap Jaw ants using cork. This method would make the tube the ideal environment for her and discourage digging into the outworld to make a nest. I have also considered using grout as the base for the outworld with a thin sand layer on top, shallow enough to prevent digging but deep enough to allow moisture dispersion without water pooling. Currently, my Ponera has been moved back into test tube environment and closed back up with a cotton ball. I expanded her sand terrain by adding roughly 1/4 tsp of sand to the test tube. I hydrated this new, dry sand with 7 additional drops of water on top of my 7 I added to her previous sand. This now gives her extra space to move and dig, ultimately making her more comfortable and means I do not have to reach as far into the tube to disperse water or place her food, thus decreasing the amount that I potentially disturb her. I can now pipette water drops closer to the entrance of the tube and let it naturally disperse through the sand toward the cotton. This will help prevent accidental overwatering and flooding and will add a better humidity gradient in the soil for her. Since moving her back into this environment and added the extra sand she has become quite active again. I will update again in a few days. IMPORTANT QUESTION: If anyone knows the answer to this, one thing I'm still unsure of with her species is do they hibernate? I haven't been able to find anyone that knows if Ponera P. hibernates or not. If you know whether they do or don't or have even found some research or previous experiences that might shed some light on this I would greatly appreciate this. Should I move this into one of the ants care forum channels or something? It's kind of becoming a blog at this point. Yep, I'm in Maryland. Severn specifically so not far at all from you. I'm not from here originally, just moved here a few years ago. And yeah, my Ponera has proven to be a lot more work than I expected. But a large part of that is because I'm also learning and testing different things with her to try to find what works best for her. I want to give her an out world for my own convenience but I'm trying to find a way to do this while also preserving the humidity. She's a subterranean species and doesn't really need an open out world. It's actually not a good idea due to how fast humidity dries out with it. It needs to allow aeration obviously but also needs to maintain humidity. At the moment, I'm thinking of taking a small plastic container I have and putting a grout and sand substrate in it and plugging her tube with a piece of Styrofoam. I would use cotton in the lid to allow me to access the inside but also hold humidity. I've also thought of using a petri dish due to the easy to remove nature of the lid. And they don't seal tight enough to stop air flow but are also good for holding humidity. I'll be posting a new update in a few more weeks. Nothing significant has changed other than her larvae developing below surface. Once something more significant happens, such as me connecting a new form of out world or her first nanantic (is it nanatic or ninantic?) coming about, I'm holding off on continuing to post. The formicarium setup I mentioned previously.